We have a pool. Sort of. It's one of those plastic deals from Wal-Mart. Granted, it's the big plastic one with the slide in it and everything, but it's still small. When all three of my kids get in it, there's not much room left. Even the shortest of them could put their heads at the bottom and keep their feet at the top of the slide. Why? Because it's the only pool they have. 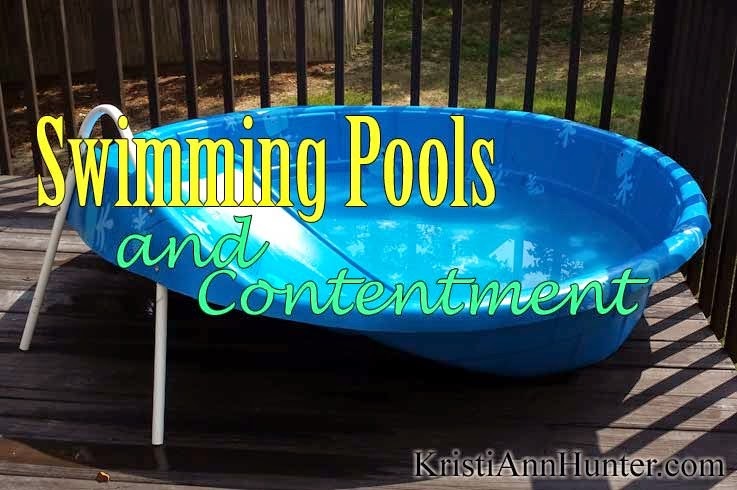 We've talked about bigger pool options, but our sloping yard and my tendency to forget to maintain anything non-living make a larger pool a rather big deal. Until then, we'll let them splash around in a plastic Wal-Mart special. And they'll be happy. They can't change the size of the pool or give it a bigger slide, but they can choose to play games that work in their confined space. They can enjoy the simple sensation of playing in water on a hot day. They have discovered very creative ways to enjoy their two foot slide. Which is something I could learn a lot from. How many times do I complain to God that my "pool" isn't big enough? That my life contains too much splashing? The fact is, this is the only life I'll get. Some things I have little to no control over. I have to leave them in God's capable hands because I have no say in whether or not cancer, a tragic accident, or a job layoff pops into my life. But how I react? How I live within the conditions I'm in? That one's on me.